There is spellbinding beauty in “yellow, yellow” gold. But gold is not always yellow. If individual gold atoms are clumped together in small quantities – agglomerated – they assume various colors depending upon the physical properties of the agglomerates. If all the particles are of about the same size and shape, the color and other physical properties, when duplicated, are exactly reproduced. Interestingly, aggregates can be grown with a specific geometry. They can even be grown into the particularly useful form – nanorods. The assortment of colors that can be produced ranges from red to purple to blue. If gold nanoparticles grown with the desired characteristics are not stabilized, the particles may continue to grow and change. To avoid this, scientists apply a surface-stabilizing agent to coat the particles. This coating inhibits growth and is frequently chosen to impart additional useful properties. It might seem atom agglomerates would serve little practical use. But there are a number of research areas that progress because of them. 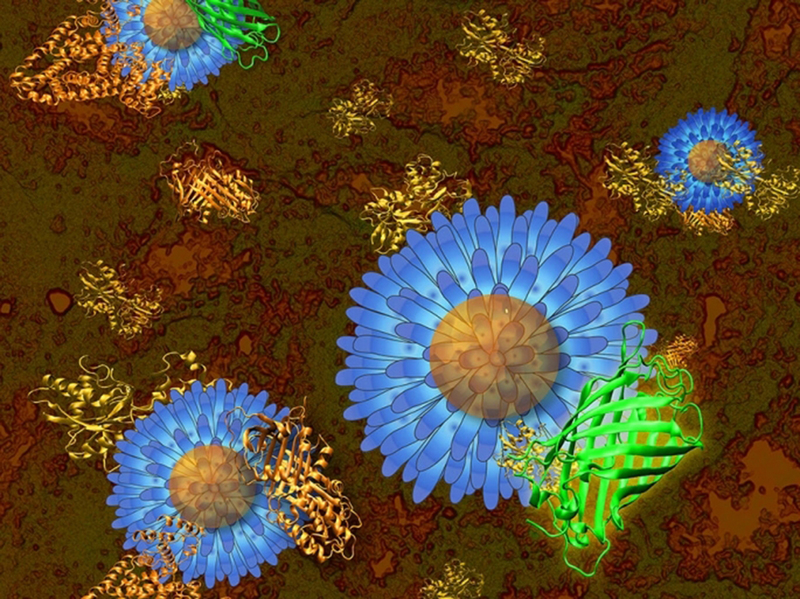 Gold nanoparticles are useful as biological probes. They can transport drugs to an anatomical site, such as a tumor. They make excellent contrast agents improving tissue visualization. The most commonly used form of gold to prepare nanoparticles is chlorauric acid, HAuCl4. Varying additives and procedures reduce this soluble gold salt to the insoluble colloidal particles to the varying sizes and geometrical shapes of the nanoparticle endproducts. Sodium citrate additive is used to generate gold “nanospheres”. The characteristics of those spheres are adjusted by varying the concentration of the sodium citrate solution. However, in the human body, cytotoxicity is of concern, and citrate imposes a degree of toxicity, so citrate concentrations need to be kept to a minimum. That means scientists needed to find new ways to generate gold nanoparticles. Energetically undemanding and ecologically friendly, the generation of gold nanoparticles is now being investigated using bacterium. One bacterium variety undergoing investigation is Geobacillus. Two added benefits to this technique are inherent stability of the particles added to their relatively low cost. Researchers can prepare short chains of attached gold atoms, or gold nanorods using a mixture of sodium borohydride and sodium hydroxide. Gold nanorods excel in absorbing infrared radiation. The particles are selectively taken up by tumor cells, rather than healthy cells. Afterward, infrared radiation is applied, the nanorods heat up, and the cancer cells are destroyed. In another application, using nanorods in the manufacture of electronic display devices, the positioning or orientation of gold nanorods can be shifted using an electric field. Gold nanorod reflectivity varies greatly with rod spatial orientation. If all the particles are oriented one way, they do not absorb greatly, corresponding to an “off” position. In another orientation, they absorb greatly. This is the “on” position. A man I have met since writing this article was treated in this fashion for lung cancer. He had six spots on his lungs. Most exceptional and curious is the fact that after some post-treatment months had gone by, not one spot was to be found! I think that this new nano rod technology will make huge advances in treating cancer and hopefully in the very near future. Great information Vincent. I applaud you for this article. Well done. You are very kind, Anthony. I’m curious now about colloidal silver. I don’t mean its popularly reputed curative powers, but how it may affect the use of various radiative treatments.